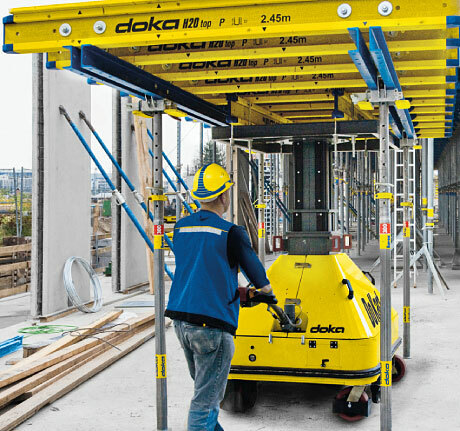 With Doka repositioning equipment, slab-forming operations can be accomplished even faster. By making the crane unnecessary for both the horizontal and vertical repositioning operations, they simplify and optimize the logistics for the entire site, by eliminating unproductive and costly waiting times. The craneage saved here is then available for use elsewhere, which accelerates the entire construction cycle. This saves on labor costs and boosts the contractors' competitiveness. safe vertical repositioning of tables during high winds, up to speeds of 45 mph. 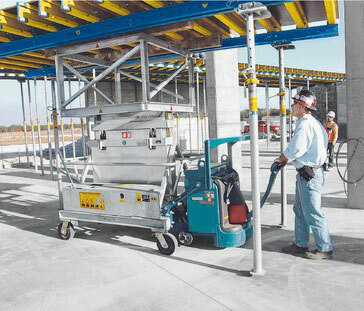 The electric powered lifting platform TLS can be installed at any location along the slab edge and is secured to the building with two simple stop anchors. The new DoKart is a "high-performer" whose innovative design perfectly suits it for the rough-and-tumble of everyday work on the site. The DoKart stands out for its great ease of operation, which ensures fast swift and easy cycling. The DoKart's ability to move 90° sideways, and to rotate around its center line, cuts the distance it needs to cover and makes it even easier and quicker to travel the tables. Work is progressed up still further by the high lifting speed. It takes only 1 second to raise the tableform 4 inches, taking it immediately to the right height for its next time of use. One man can move a complete formwork table unit quickly and efficiently. 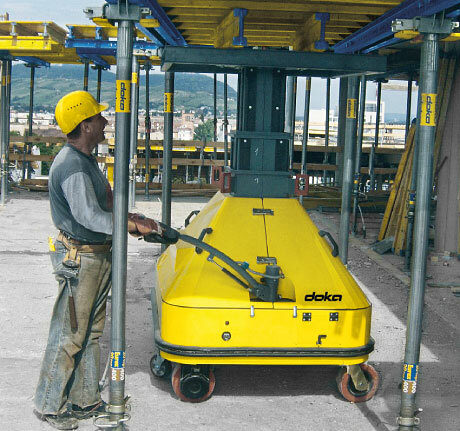 By using the shifting trolley, Dokamatic tabels can be lowered and moved hydraulically, quickly and safely, to the next section on the same level. The attachable drive unit enables an easy repositioning of the Dokamatic tables. The transport fork DM 1.5t adjustable, is rated for loads up to 3,300 lbs., and it folds down for transport to site. The forks adjust to four different widths, so they adapt perfectly to any table dimension or specific application. The pawl lock facilitates fork positioning and ensures maximum safety while repositioning is in progress. The Dokamatic 13.00 m repositioning slings lift the Dokamatic tables off the extending platform and up to the next level. 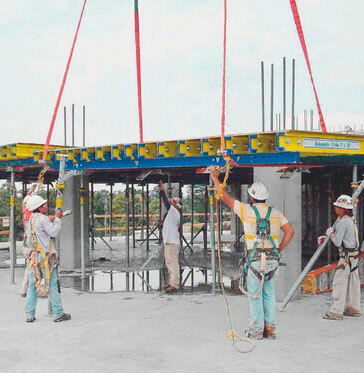 The repositioning sling 13.00 m is used to lift the entire preassembled table unit. The strap is 42 ft. in length and is easy to engage and disengage. 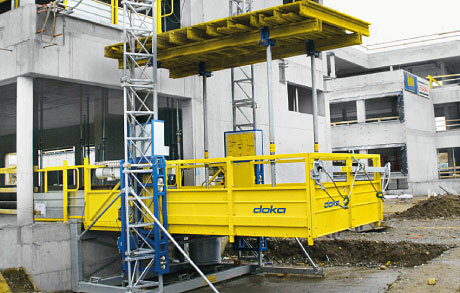 The Doka outrigger platform can be built to any size to accommodate specific jobsite conditions. 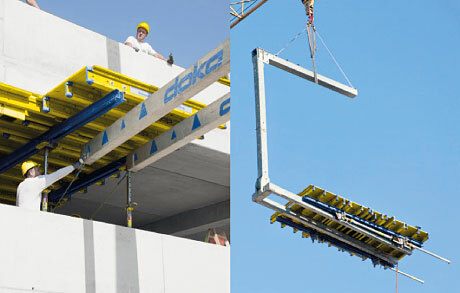 Using the Dokamatic lifting strap, the Dokamatic tables can be quickly lifted off the loading platform and up to the next level. The Table Lifting System TLS sets a brand-new benchmark for craneless vertical repositioning of tableforms. It makes a major contribution towards optimizing the site logistics, and is designed to provide the very highest workplace safety. The Table Lifting System TLS can also be stood on the ground, making it possible to start repositioning tables right from the very first story. The TLS is an electric powered lifting platform that allows pre-assembled Dokamatic tables to be cycled between floors on a building structure without the need for a crane. 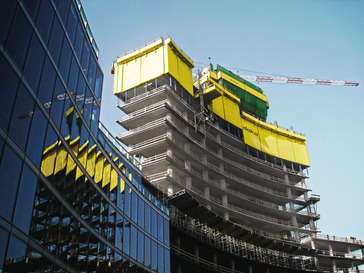 TLS takes the crane requirement completely out of the formwork cycle and makes it available for other tasks. 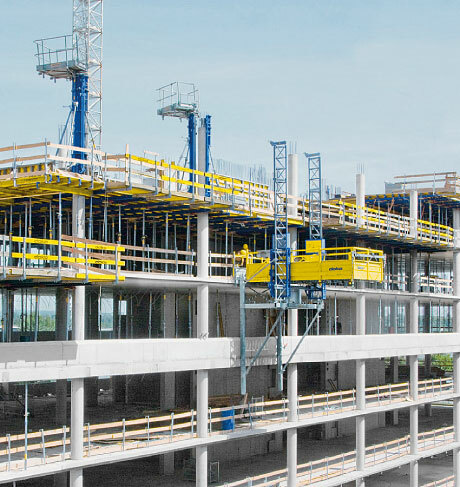 No more waiting for the crane provides for a continuous cycle of equipment - No lag time. Short lifting times because the TLS provides a continuous lifting speed of 40 ft./min. Automation of the system allows for assembly line production. 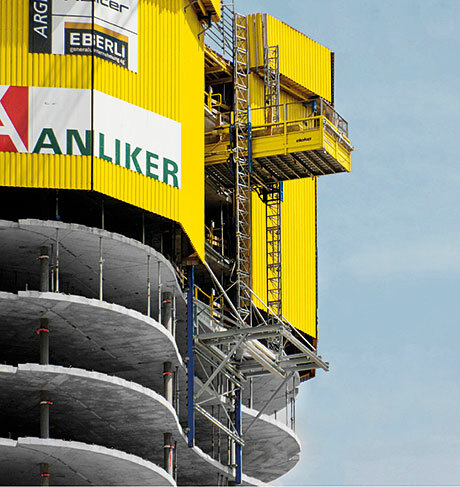 The Table Lifting System TLS saves precious crane time. This frees up the crane for other work, in turn speeding up the whole progress of construction. By making the site independent of the wind conditions, the TLS makes a double contribution towards speeding up the work. Table repositioning operations can now continue undisturbed even in windier conditions – and still in complete safety. Manpower can be deployed very efficiently, and fast construction progress achieved, with the interoperable shifting appliances. These make it possible for the tableforms to be travelled to and from the TLS quickly and easily, by just one worker. 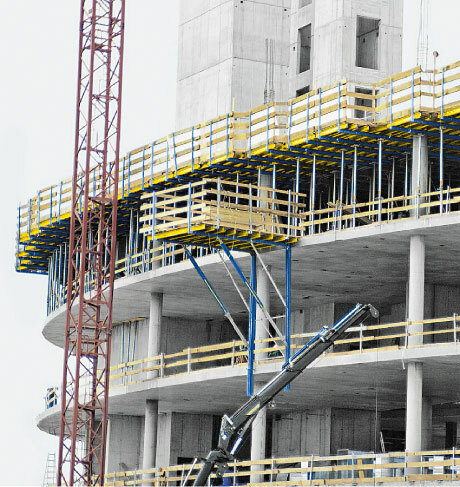 In addition to the crane-lifted version of the TLS that is suspended from the slab, the TLS can also be used as a self-climbed system for any structure height. The self-climbing solution delivers even more crane-time savings and safety on the site, as the TLS can now be "jumped" 100% automatically. 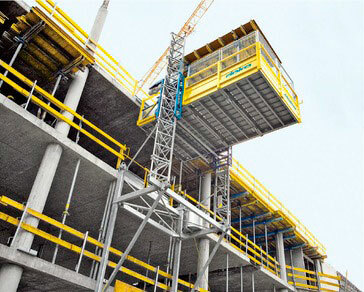 The self-climbing TLS is the perfect add-on to Doka tableforms and to the protection screens at the slab-edges. 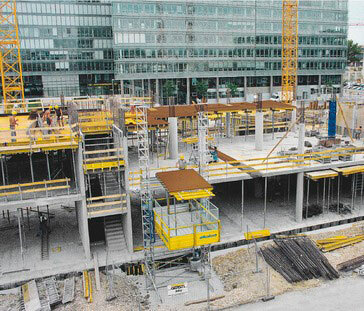 This equipment line-up is the ideal slab formwork system for tall structures. Alternatively, where sufficient craneage is available the TLS can also be structure-guided and raised by crane – in any weather.